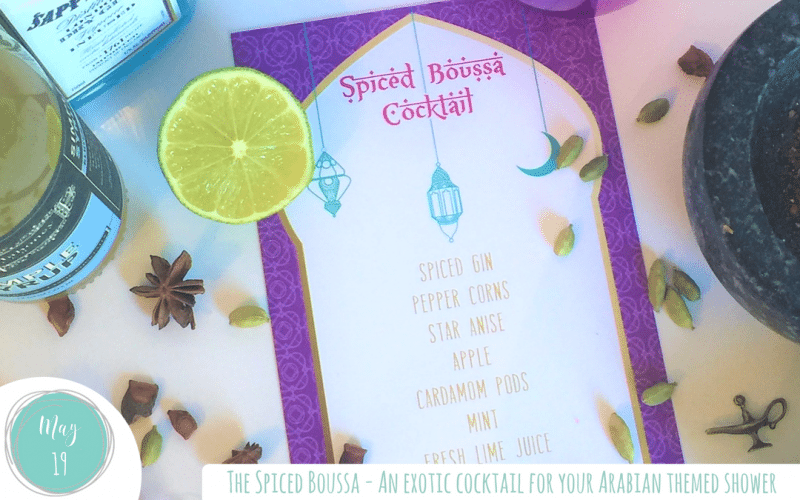 If you are hosting an event like a bridal shower it is always lovely to include a signature cocktail such as this Arabian Spiced Boussa (Kiss) Cocktail. For my Arabian Nights bridal shower I really wanted something a little exotic and spicy that would also fit well with the rich color palette. So when I was planning I called my friend Jason who runs a private bartending business back in Australia, Bondi Bartenders. When I lived there I used to looooove being his taster for new cocktails he was experimenting with and I knew he’d put me in the right direction. Side note – he is moving to New York so if you live there look him up! Jason, amazingly, happened to be creating cocktail recipes for a new spiced Gin brand (Ophir gin). Spiced gin? Yes! perfect, just what I was looking for. Unfortunately, Ophir spiced gin is not here in the US until summer. So, I created the spice by pre-smoking the glass and using a light straight gin, Bombay. If you want to increase the spice level beyond this substitute the fever tree tonic with a spiced tonic from Fentimans or Liber & Co.
I’ve called this cocktail the Spice Boussa, Boussa is Arabic for Kiss in keeping with the exotic and romantic. This cocktail is delicious and the act of smoking the glass also lends an additional exotic twist to the cocktail experience. It will impress the bride-to-be and all of your guests! Step 1. Put some pepper corns and a star anise in a pestle and mortar, torch them and once smoking, stick your purple glass over the top to capture the smoky spicy scent. Step 7: Garnish with a star anise and a mint sprig. I served these to the guests before we sat down to lunch and I am in love with the smoky and spicy flavor and the delicious aroma that accompanies it’s creation. Make sure to check out my Arabian Nights Bridal Shower, DIY Centerpieces and DIY Favors for even more bridal shower inspiration!